If your business is operating overseas then you may be asked for an apostille certificate for company documents. We can prepare a bound set of documents for you to save you time and money. A fully inclusive service with professional presentation and solicitor certification included. 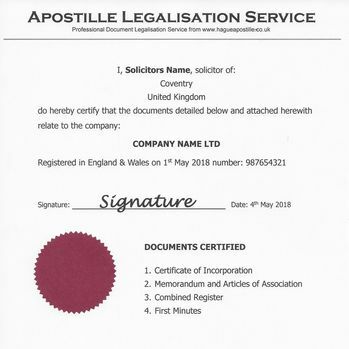 For ONLY £90 we arrange for your Company Documents to be legalised as one set with the apostille. Check documents sent to us by email or we can download them from Companies House. Our solicitor will prepare a cover sheet and bind the documents together as one set. They are signed by the solicitor. How to order an apostille for a set of documents? Order the bound set option online or complete the printed order form. Email or post the documents to us. If you need us to download documents from Companies House please let us know. Is a set of documents suitable? Before ordering we recommend that you speak to the person requesting your documents to see if binding the documents into a set will be acceptable. Occasionally some organisations prefer that each document has a separate apostille. The fee for the solicitor certification and apostille for a set of company documents is £90.00. If you need to discuss this please contact us for advice. Some documents cannot be added to sets as they need independent verification or certification. This includes power of attorneys, contracts, agreements or documents relating to banking, finance or payments.